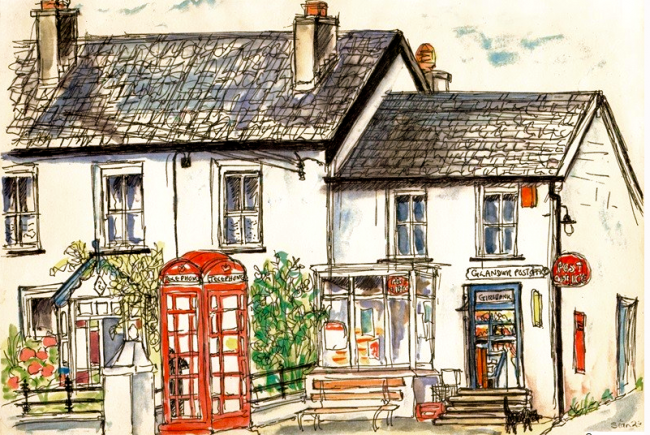 Glandwr Village SOS - Save Our Shop! Our village shop, which has been here for over 70 years, closed recently, and is to be sold at auction on July 12th 2013. We want to save it, and reopen it as heart of the community that it once was! Our once-vibrant village has been stripped of nearly all its assets, with the school closing seven years ago, and the shop more recently. We formed a community group with the intent of buying the shop, to provide a much-needed facility for top-up shopping, meeting each other, and buying & selling a wide range of locally produced goods, including home-made bread, preserves, cakes & cookies, as well as free range eggs, and organically grown fruit & vegetables, home-made soaps, and artwork from well-known local artists. •	Buy the telephone box from BT and re-use - ideas welcome! The social capital growth since we began trading has been considerable, so much so I wish there were a linear measure for it! We have a rota of over 20 volunteers who commit to opening and running the shop. Opening the shop has brought our community more alive, it brings people together for groceries but also a social interaction across the generations of older Welsh villagers and the newer incomers. In terms of the local economy we offer an outlet for local producers who wouldn’t necessarily sell elsewhere because of the small quantities they offer, or the distance they would have to travel to sell. So for them and us we tick all the value boxes; low impact, high respect, and value and at the end of the food chain happy eaters! In time we want to offer more structured volunteering positions for individuals from other groups and agencies, which in turn can lead to increasing people’s employability options. Buy the village shop at the upcoming auction. As a small rural village shop, networking with other groups is essential to our future sustainability. To be able to share & barter with other community shops and community centres in our area would be to everyone’s benefit, whilst at the same time not detracting from what we produce best locally. We are already actively involved with two other local groups in nearby areas. It doesn’t matter what the goods / or service is, someone always wants to know about it, have some, share or give to! The shop enables communities to exchange information and as we all know word of mouth really is the best marketing tool – and its free! Bad news! Auction was yesterday, and we were outbid. New owners bought mainly for the accommodation, however, so are open to discussions about the future of the shop. These will take place after Completion in 28 days. In the meantime, we will continue to trade as normal from the current temporary location. Your continued support is greatly appreciated. Shop on the village square, with attached 4-bed house. Siop Glandwr is a small community shop in the premises of the Old Post Office in the village of Glandwr in North Pembrokeshire on the border with Carmarthenshire. There has been a village shop here for over seventy years until quite recently when the current owners due to financial difficulty closed the shop. Having secured a business loan against their home, adjacent to the shop and found it increasingly more difficult to manage financially the bank are recalling their loan. In March 2012 a small but passionate group of individuals in the village began working to revive and re-open the shop as a community venture. A campaign was mounted to canvass local opinion, with over 90% of those asked reporting they wanted their village shop back. This positive drive was slowed down by the threat of losing the premises to repossession. In November 2012, the owners' bank were persuaded by the Community Group to grant an extra six months to the loan repayment deadline – to give us time to acquire funding to buy the premises. In the meantime, the shop was opened on a regular basis two days a week. This extended deadline ended on May 1st 2013, and we had to vacate the shop as the owners decided to take the premises to auction in order to repay the bank loan. We intend to bid at the auction, and have secured a loan of 70% of the estimated value from a well-known ethical bank. Yet, this, plus the proceeds of a share buying event, donations and operating profit, is not quite enough to cover the predicted cost at the auction, which is on July 12th 2013. Rallying the community together to get the initiative off the ground has been action lead, and carried through each week by a strong commitment to continue making it work. All this will disappear if we can’t secure the funding to buy the premises. With it will go all the good will, and sustainable objectives that Wales has to offer. All the deep green values of localism meanno thing if we can’t get the right sort of help to help ourselves. Pembokeshire and Wales is awash with skilled vibrant people who can learn lots from community growing; action planning; business planning and fundraising; and our initiative is no exception - but very often what we need is simply access to funds to buy the premises, so we can carry on doing what we are already doing and do it better and for longer. Project Delivery Manager: Glandwr Community Shop (Siop Glandwr) The Project Delivery Manager takes legal responsibility for receiving and spending the funds raised and ensuring the project is delivered. Contractors: Fenton Surveys (Surveyor),Anthony & Jarvie (Solicitors),John Francis (Narberth) - Estate Agents The team responsible for building or installing the project.